Thanks to everyone that participated today. Love this place! Excellent win against a legit SEC #1 starter. Have to give Sikkema credit, he was outstanding for Mizzou today. Noland/Ramage/Kopps/Cronin were simply better! Awesome job HFR and ARKANSAS! Hope to see everyone tomorrow! Someone should slap the shtt out of that kid for almost interfeering. Very entertaining game.....and the good guys won! Cronin was 95 MPH to the first batter. FB down to 91/92 for the third batter. I thought it was vice versa. 91-92 first batter. 95-96 to last out. Dude ran a mile to get to that ball! Great win! What was up with Bartman in the stands? I guess that pitching rotation shuffle for Missouri didn't work. THANKS HogsFansReunited for another great PXP! No they almost ceded the win yesterday to try to win today and force a rubber match. Ramage gets the win, now 4-0. Cronin gets his 6th save. Careful...the innocence of childhood should not come with vitriol. SCAN alert? We go for the sweep tomorrow with 1st pitch at 1:30pm. ucahogfan will have the PXP. You know I am right though. Thanks to all who posted in the thread today! Great thread. Just keep him away for game winning interference plays. Nah, I watched the gun closely on every pitch there in the 9th because I know Cronin sometimes struggles to maintain. I was happy to see he was at 95 to first batter - was like wow, maybe his endurance is up from last year. But it fell off by the third. Great save and series win nonetheless! Thanks HFR and the rest of the team here. Had to work until 4:30 today, so just went back through and was able to see how it all played out before the bottom of the 8th when I could get it on. So what do you guys think about the big box suites in the back of left field ? I think it looks stupid and it infringes the tradition on that location being for the everyday fans who can only afford the cheaper seats behind left field in the hog pen. Amazing that we started the game with the bases loaded in the 1st and found a way to get out of the jam. That won the game for us. I agree but they are making a killing of them. Can’t fault the U of A for going after that much money. Long as it stays in the back, I see no harm. Outstanding!!! I’m sitting right next to a die-hard tiger. Boy, do I feel good about now. Thanks for another great thread. Relied on it to follow best I could as I was out and about. 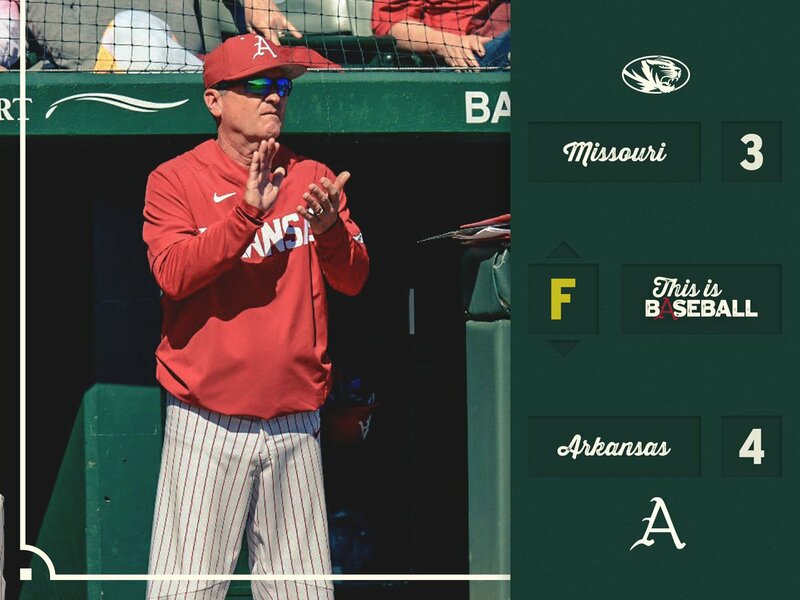 WPS! It was a beautiful day at Baum! Pumped to get the win over a really good pitcher. -Great job by Connor to get over that first inning. He's a strike-thrower and just couldn't get it down, probably a little too amped up. He honestly got us two double play-balls, which we didn't execute. Were lucky with their base running mistake. -Connor could have stayed in but you don't want to leave him in too long. We had a fresh BP. His stuff in the 3rd/4th, and even the 5th, was really good. But Connor gets it, he's a team guy. His wins are coming. Sikkema is going the whole game so they will have the BP for tomorrow, you really want to win today. -Franklin's plays obviously huge. Great hit to get those two runs, was down 1-2, and obviously a great catch. -Re 1st inning mound visit. Connor had a little bit of a mechanical issue about keeping his front side closed, he was kind of running away from his arm and leaving everything up and out, and that's not him. After that his next pitch was right where he wanted it and kind of got it going. Didn’t catch the velo on the last batter. So game 3 we have Scroggins, Vermillion who haven't pitched. Kostyshock and Kopps could probably go again. Who am I missing? Do you save Wicklander for midweek vs Texas or do you use him in game 3 if needed? What are your thoughts? If Wicklander could be the difference between winning and losing tomorrow then I expect to see him. Thanks so much for the thread. Nothing better when you're gone all Saturday than to come home and scroll through a hog win!